The Swaminayarana movement was founded by Sahajanand Swami. His original name was Ghanashyam Pande. 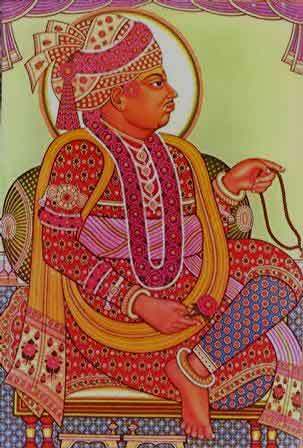 Born in a Brahmin family in 1781, at Chapaiya in Uttra Pradesh, he showed spiritual bent of mind from an early age. At the age of 11 he went on a seven year holy pilgrimage and wandered from place to place seeking spiritual answers to the questions that troubled him. During such wanderings he met Ramanand Swami who admitted him into his ascetic order known as Uddhav Sampraday and gave him a spiritual name Sahajanand Swami. When Ramanand Swami died in 1802, he became the leader of the sect. His charismatic appeal, inner purity, personal touch and wisdom drew many new followers to the sect. They considered him as God himself in human form and addressed him as Bhagawan Swaminarayan and the ascetic order he was heading as Swaminarayan sect. The sect drew large following from various parts of Gujarat, Saurashtra and Rajasthan. Inspired by his teachings, people from various castes and different backgrounds joined it. Swaminarayan attempted to reform Hinduism in many ways. Considering the fact that it was early nineteenth century it must have been a very courageous move. He was compassionate towards widows and the socially under privilege. He preached against superstition, violence, animal sacrifices, caste discrimination, female infanticide and sati. He advocated strict adherence to ancient vedic traditions and pure Vaishnava dharma. He laid emphasis on devotion and encouraged people to worship images and idols of their personal gods and goddesses by visiting temples. He believed in the segregation of sexes, the importance of virtuous living, the need for inner purity and self-discipline and adherence to scriptural injunctions. To establish a tradition of temple centric image worship and devotion to God, he undertook the construction of nine temples in various parts of western India installing images of Narnarayan, Lakshminarayan, Radha, Krishna and other divinities. Swaminarayan left a record of his teachings in the form of two works which together constitute the sacred literature of the sect. One is a compilation of his commandments for his followers to abide by. It is known as Sikshapatri or a document of education. The other is a collection of the discourses he delivered at various places during his life time, which is known as Vachanamrit or nectar of speeches. The Shikshaparti is meant for the education and discipline of the monks who joined the sect. They are considered to be inviolable by the followers of the sect. It contains 212 Sanskrit verses prescribing do's and don'ts on a wide range of topics. Reproduced below are a few sample summarized instructions from the Shikshapatri to convey an idea about the nature of its content. Not to kill intentionally any living creature including insects and bugs. Not to indulge in vice such as gambling, adultery, drinking wine or other intoxicating drinks. To follow the varnashrama dharma faithfully. Not to make or take medicine which contain alcohol or meat. Male disciples should never listen to discourses given by females. Not to go empty handed to a guru, deity or king. Not to wear clothes that would expose one's body indecently. Different marks and symbols for followers different castes. The discourses of Swaminarayan, preserved by his close disciples, constitute the subject matter of Vachanmrit. They contain the profound wisdom of Swaminnarayan on various subjects such as renunciation, devotion, anger, lust, delusion, dharma, jiva, Ishwar, types of faith, soul and body, the form of God, tattvas, salvation and so on. The recording of the discourses were personally approved by Swaminarayan to preserve their purity and authenticity. Some sample statements are reproduced below from the Vachanamrit for the benefit of the readers. Lust: Feeling and behaving totally as Atma, implicit observance of eight fold celibacy, observance of five injunctions – and realizing the infinite glory of God in human form, would help one to eradicate carnal desire in full. Attachment: One who observes Dharma fully and also possesses the knowledge of God should yet be avoided if he has gross attachment to worldly objects; viz he is pragmatically wise and yet has ego of his position. Mind: When such thoughts arise in the mind and they can not be suppressed, one should leave meditation at once and should at the top of his voice chant the `Swaminarayan' mantra. He should pray to God, pray to such great saints like Muktanand Swami. Devotion: Bhakti develops in the heart when one realizes the greatness of the various Vibhutis of God and his various manifestations in various universes. One should also know the divinity of the abode of God viz. Golok, Vaikunth, Brahmpuri, Shwetdweep etc. His divine Leelas in the state of creation, sustenance and destruction should also be heard with rapt attention when recounted and should with dedicated devotion also listen to the divine episodes of the lives of Rama22 and Krishan, the incarnations of God. Aksharabrahman. He is the manifested immanent Brahman, who rises from the waters. He is Narayana or Vishnu, the supporter of all, who incarnates from time to time to set things right. His essential nature is infinite bliss and infinite knowledge. Iswara. He is the Cosmic soul or Paramatma on whom depends all sentient beings (bhoktas) and non-sentient objects (bhogyam). His essential nature is Truth (satyam), Knowledge (jnanam), infinity (anantam), bliss (anandam) and purity (amalatvam). He is without blemish and full of auspicious qualities. Jiva. It is the individual soul which is described as a dynamic principle (chetana tattva) whose essential nature is self-consciousness (jnanasvarupa) and bliss (anandasvarupa). Also known as atma and purusha, it is devoid of qualities. The souls are of three types, the bonded souls (baddha), the freed souls (mukta) and forever free souls (nitya). The last category of souls are again of two types: those who serve God and those who serve the devotees of God. Maya or Prakriti. It is Mother Nature or primeval substance. It is made up of three basic qualities, sattva, rajas and tamas. It is constantly subject to modifications. At the end of creation it becomes unmanifest (avyakta) and at the beginning manifest (vyakta). In its manifest form it has 23 tattvas or principles of which the first is mahat and the last earth (prithvi). Swaminarayan emphasized the importance of cultivation of virtues, pure devotion to God, practice of dharma, meditation upon the name and forms of God, image worship, visits to temple, celibacy, control of the mind and senses, service to people in the liberation of individual souls. He had visions of several gods and deities and used to converse with them in his dream state. He identified himself as a follower of Vishnu without showing any disrespect to other gods. After the passing away of Swaminarayan in 1830, the movement became mired in controversy on the question of his successor. This resulted in a schism within the group and claims and counter claims about their allegiance to the original founder. Three groups emerged each claiming to represent his teachings in letter and spirit. One group opted for the Acharya system which was said to have been proposed by Swaminarayan himself when he was alive and suggested his own relations to act as the Acharyas. This group established two gadis or vehicles one in Ahmadabad and the other at Vadtal each headed by his blood relation. This group which goes by the name Swaminarayan Sampraday presently owns most of the temples and properties belonging to the original sect. The second group believed that Swaminarayan himself nominated a close disciple of him in his life time as his spiritual successor and therefore the nomination of hereditary acharyas from the family of Swaminarain unacceptable. They consider Swami Gunatitananda as his true successor. A third group claimed itself as as Swaminarayan gadi and declared Gopalananda Swami as the spiritual successor to Swaminarayan. The Swaminarayan Sampraday, that is the first group, promptly discredited and excommunicated the followers of the other two sects which however continue to exist and carry out their own agenda of social service and propagation of the ideals expounded by Swaminarayan. In 2004 the Vadtal Swaminarayana sect received nationwide attention when four sadhus of the sect were sentenced to death by a court for their involvement in the premeditated murder of Swami Gadadharanand. The court was convinced that they plotted his murder because of his refusal to side with them in a major power struggle between the Acharyas and the sadhus to gain control over the temple administration and its funds. A few months after this incident, in the same year, two priests of a temple of the sect were caught in a video tape in compromising position with a woman. When the tapes surfaced, the priests absconded. In 2006 three sadhus of the sect were involved in a case of sexual harassment of a 14 year old boy and sentenced to 14 months' imprisonment. It is perhaps unfair to judge the true nature of this movement or its spiritual value by a few incidents such as these in its long history of nearly 200 years. The Swaminarayan movement continues to be a major driving force in Gujarat and several other parts of the world where Gujarathi community is found in sizeable numbers.